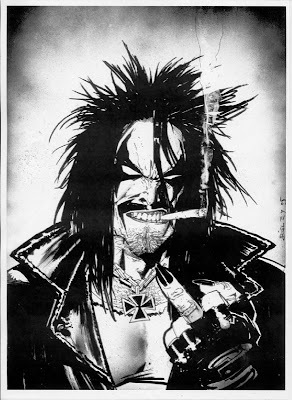 Since today is artist Simon Bisley's birthday (at least according to his seemingly-official Facebook fan page), I thought would be cool to give him a shout-out and reflect on what his most popular title did for me as a kid. When I was 14, I wasn't reading comics. But my then-boyfriend was, and he'd take me to the comic shop with him on his weekly runs. During one visit, the guy working at the shop - having seen my black-clad frame enough times - handed me a promo pin that dictated, "Bite Me, Fanboy." What was this? Was this a vampire thing? I didn't know what any of it was about, but I did know I wanted to wear that pin on my MC jacket without seeming like a "poseur," so I bought Lobo's Back #1, the comic it was promoting. That began not only my love affair with comics outside the realm of friendly superheroes, but in poring over the art of Simon Bisley, I discovered that he too was a metalhead. How? The band names he drew (Ramones, Slayer) as graffiti on various walls throughout the mini series among the other gems hidden in plain sight within the pages. That was when I first began to understand subversion. From then on, any piece of sequential art I came across became subject to such scrutiny, and the habit stayed with me for life - when appreciating with any art form. My permanent takeaway: look past the obvious; seek out hidden meanings; and do something similar when you can. For sparking that inquisitive spirit, I'll forever be in Biz's debt. More on Lobo - my favorite comic character to this day - can be uncovered by reading THIS. Now frag off!